Sweet potatoes are such a great alternative to potatoes and have so many health benefits. I love making French fries and burgers with sweet potatoes, but since my family loves a good Mexican meal I went ahead and made a sweet potato quesadilla. It was a hit we all loved it. Give it a try, you will not be disappointed. It’s super easy and great for a weeknight dinner. This is totally optional but you can microwave the sweet potatoes instead of boiling them. Fill the pot about half full (you will need just enough water to cover the sweet potatoes) and add a dash of salt. Bring to boiling. Add sweet potatoes. Cover the pan and cook sweet potatoes for 15 to 20 minutes or until just tender on the outside but resistant in the center when pierced with a knife. Set aside to cool. Remove the skin of the sweet potatoes. Mash the potatoes, add butter, salt & pepper. Take tortilla and spread the sweet potatoes. Top with cheese and pancetta. Fold tortilla over and place on a hot skillet. Press down and brown quesadilla for about 3-4 minutes per side. Yum! 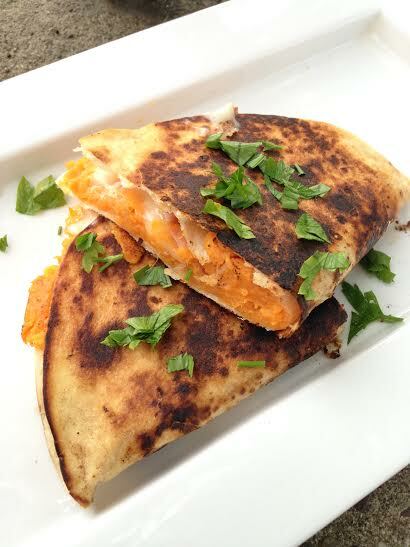 I love the idea of incorporating sweet potatoes into quesadillas!